Posted by Madam Chow Published in mushrooms, pie, You Want Pies With That? Is to make midnight mushrooms, . . . .
William Shakespeare (1564–1616), British poet. The Tempest (V, i). The beginning of the speech in which Prospero renounces his magic powers. The Unabridged William Shakespeare, William George Clark and William Aldis Wright, eds. (1989) Running Press. Source. I baked this pie before the recent demise of my oven. RIP. This month, Mary the Food Librarian picked the theme of “Literary Pies” for “You Want Pies with That?” Mary said we’d get bonus points if we’d been to the library in the past year, and I’m happy to say that I go several times a month. I LOVE the library. When I was a kid, my father was concerned that I was turning into a bookworm, and restricted me to one visit per week. I would check out 12 books (the limit back then), and read them all in 4 or 5 days. I would then go through withdrawals until my next visit. His restriction actually helped my reading because I quickly discovered the loads of books my folks had all over the house, and I found myself turning the pages of the The Good Earth and Bury My Heart at Wounded Knee at a very young age. I taught myself to read Spanish by age 7 (I already spoke it) by reading an Argentine cookbook and kid magazines. Needless to say, his well-intentioned experiment was an abject failure. You can take the girl out of the library, but you can’t take the library out of the girl. Put the flour and salt in a food processor fitted with a metal blade; pulse just to combine the ingredients. Drop in the butter and shortening and pulse only until the butter and shortening are cut into the flour. Do not overmix. Dorie says that what you’re looking for is to have pieces the size of fat green peas and others the size of barley. Pulsing the machine on and off, add 6 tablespoons of the water—add a little water and pulse once; add some more water and pulse again; and keep going that way. Then use a few long pulses to get the water into the flour. If after a dozen or so pulses, the dough doesn’t look either (1) evenly moistened or (2) like it’s forming soft curds, pulse in as much of the remaining water, or even a few drops more, to get a dough that will stick together when pinched. If you’ve got big pieces of butter, that’s fine. The dough is ready and should be scraped out of the work bowl and on to a smooth work surface. Shape the dough into a disk and wrap it. Refrigerate the dough at least 1 hour before rolling. I have had even better results if I let the dough rest over night, or even if I freeze it and use it later. The dough can be kept in the refrigerator for up to 5 days or frozen for up to 1 month. Once the dough is fitted into the pie plate, refrigerate it again. Roll out the top crust and place on a baking sheet in the refrigerator. Preheat the oven to 400 F, setting a rack in the lower third. Take the Boursin cheese out of the refrigerator and let it sit on the counter while you prepare the filling. Clean and slice the mushrooms and leeks. Add about 1 Tbsp. of olive oil to a large saute pan and set heat to medium. Add the mushrooms and leeks and saute gently. You do not want the vegetables to overbrown (a little is OK). What you do want is for them to give up a lot of their liquids. This will prevent a soggy crust, and may take a while, depending on how juicy your leeks and mushrooms were. After a couple minutes, you will see a lot of water come out. Add a pinch or two of salt and some pepper, then the thyme and the Tabasco. Then keep cooking until most of the water evaporates. Take the vegetable mixture of the heat and add the Boursin cheese. Stir it in gently – it will melt and incorporate into the vegetables. Taste and see if you need to add more salt, pepper, or Tabasco. Set aside. Remove your crust from the refrigerator and paint a thin layer of Dijon mustard on the bottom of it using a pastry brush or the back of a spoon. A little goes a long way – if you go overboard, you’ll end up with a strong mustard flavor. 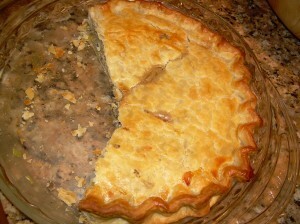 Spoon the filling evenly into the pie dish and cover with the top crust, and crimp the edges. Cut a few vents into the top crust, and brush lightly with egg wash. Place pie in lower third of the oven and bake for about 30-35 minutes, or until crust is golden brown. Remove and let cool before serving. Your pie sounds yummy. I love leeks and mushrooms. Love your story about the library too. I love your inspiration! I am an avid reader as well. Well done! teary eyes…What a great post! Love your library and reading adventures!!! And this pie looks so yummy. It might be our first savory pie! How perfect is that?! Thank you for playing along with my theme! This pie sounds so good! I’ll take a slice of your midnight mushroom pie anytime! 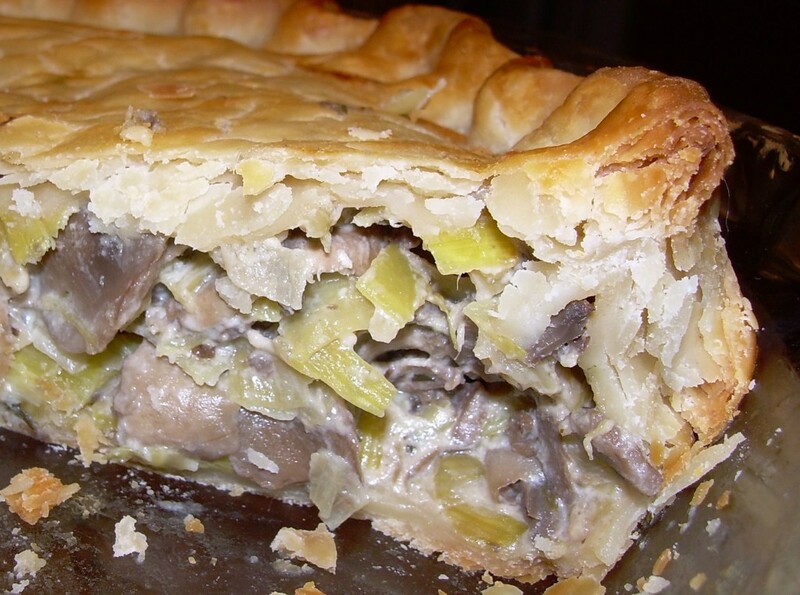 That sounds fabulous–I love mushrooms and leeks! And “you can take the girl out of the library, but you can’t take the library out of the girl.” So true. =) I still love to go to the library. Some authors I love so much that I have to own their books so I can read them again and again. But others I’m happy to just borrow. I just recently took Brianna to get a library card of her own. Mmm, books and pie. Hard to imagine anything better. I love love love mushrooms! This savory pie looks so good! Great inspiration! Always a fan of savory pies. Well, it looks like your oven went out with a bang! This sounds like an excellent “last thing to bake”. I just recently fell in love with leeks and I already love mushrooms. Your pie sounds delish! What a great savoury pie! Definitely wise and woodsy – and you don’t get much more literary than Shakes!